If you want answers quickly and for free, there is no better place than the Microsoft Dynamics Forums on MSDN. We have a lot of dedicated people monitoring this forum who are passionate about providing solutions. There are many ways to learn about using, extending and installing Microsoft Dynamics CRM. Start with the Community Top 10 Microsoft Dynamics CRM sites (aka CRM 101). 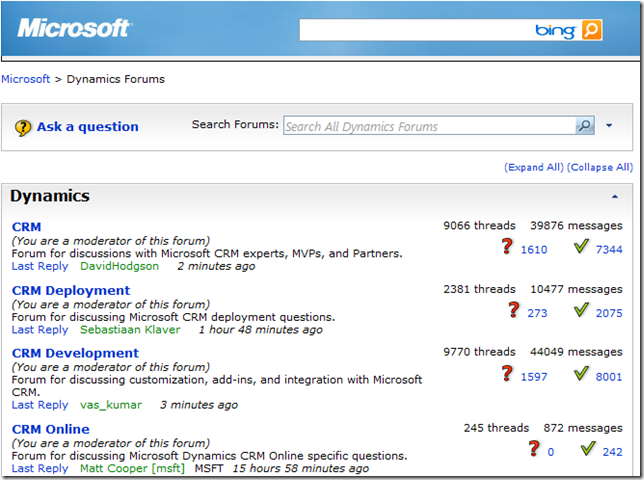 Use the Microsoft Dynamics Forums to get your basic answers quickly. Create a Windows Live ID so that your questions (and answers) can be tracked. There are so many benefits to this step that I won’t enumerate them here. Search to see if your question has already be ask and answered. Ask in the Correct Forum. 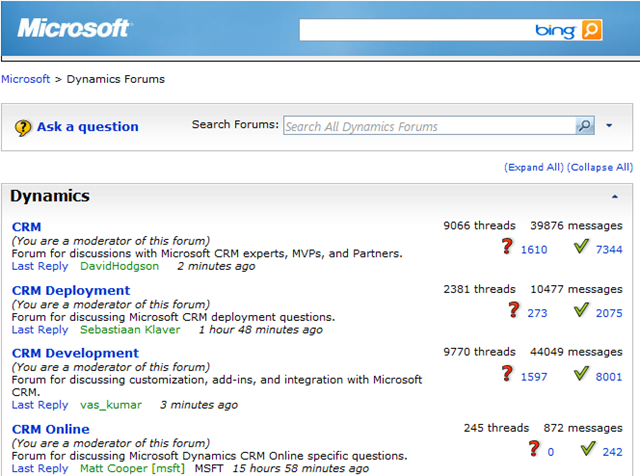 For example if the question is specifically about development, don’t ask in the CRM deployment forum. Title the question clearly. A topic titled “HELP” does let the people who answer questions know if they are the right person to answer the question. Give us enough information to help you. For example if you are using a legacy program like CRM 3.0 or such, we would need to know that before we try to answer the question. Here’s hoping that 2010 brings you a year of success and achievements in all your endeavors.